The heart of the business, comprising 60,000 square feet of space and providing a safe, dry home for all of our brands. We know that when a customer places their order, they want it delivered in full, on time and in spec. So that’s what we do. 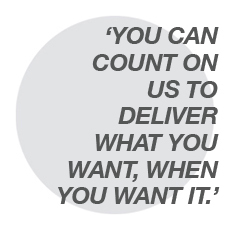 You can count on us to deliver what you want, when you want it.